Jan Gerrit van Bronchorst began his career painting stained-glass windows. It would seem that he first trained in his native city of Utrecht and later pursued his studies in Arras and Paris. After this phase he settled in Utrecht where he worked in Gerrit van Honthorst’s studio and consequently came into contact with easel painting. In 1639 he is registered in the Guild of Saint Luke in Utrecht. Bronchorst produced oil paintings, stained glass and prints throughout his career. Young Man playing the Theorbo belonged to Sir Arthur du Cros at Craigwell Manor, Bognor and was not auctioned with the rest of his collection at Christie’s in 1973. It was, however, sold at Christie’s in 1980, catalogued as a work by Jan Gerrit van Bronchorst, and was subsequently owned by Speelman. 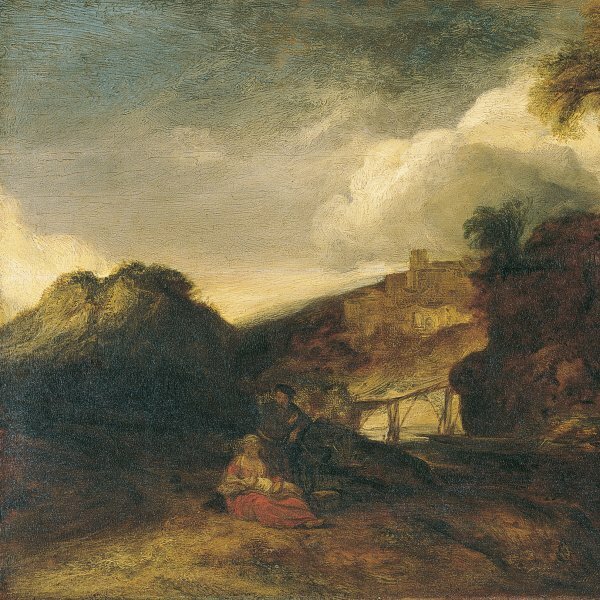 It was then with Colnaghi in London from whom it was acquired in 1981 by the Thyssen- Bornemisza collection as an autograph work by Jan Hermansz. Van Bijlert and was compared with regard to its date and subject with a painting of a Young Man playing a Fluteby Bijlert’s teacher Abraham Bloemaert in the Centraal Museum, Utrecht. The painting was not referred to in one of the most important texts on Bijlert by Hoogewerff, published in 1965.When analyzing the canvas in his study of Dutch paintings in the Thyssen- Bornemisza collection, Gaskell opted to tentatively attribute it to Bijlert.He referred to other early oils by the artist of between 1625 and 1635. In these works Bijlert depicted half-length figures of shepherds against plain backgrounds, such as the example in the Indianapolis Museum of Art in which the figure carves a flute or the one in the Centraal Museum in Utrecht in which he is playing this instrument. Such compositions follow a typology developed by Honthorst and Terbrugghen and which is also to be found in the work of Abraham Bloemaert. In the catalogue raisonné of Bijlert by Paul Huys Janssen the painting is included in the section on rejected attributions and is attributed to Jan Gerrit van Bronchorst. This opinion was shared by Thomas Döring who included the canvas within Bronchorst’s oeuvre, dating it to around 1642‒45. 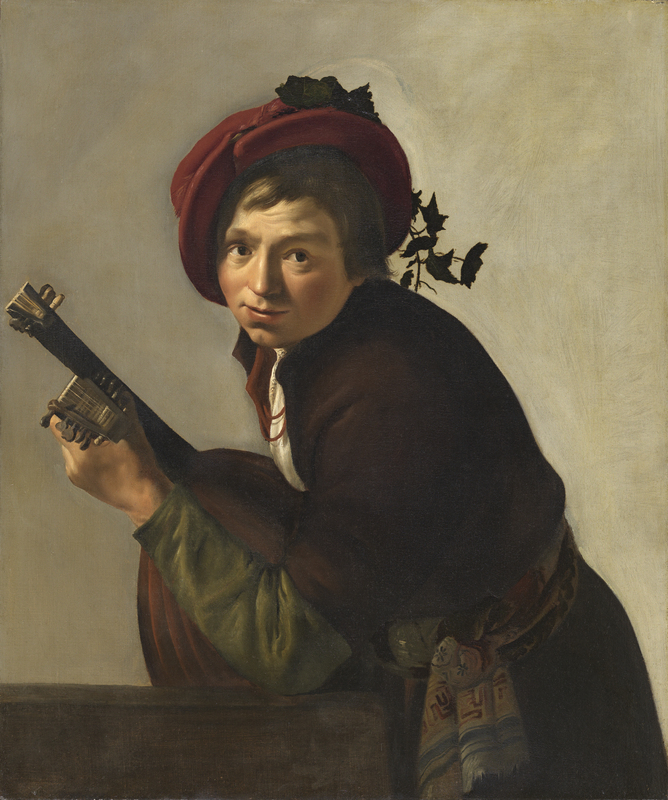 The figure of the young man playing the theorbo is modeled through the light that falls brightly on his face and on the hand playing the instrument, leaving his body in shade. The pose of the body is interesting, arranged parallel to the picture plane with the arm that supports the instrument resting on a ledge and the head turned out towards the viewer. The colours used for the clothes create a strong contrast with the red hat decorated with a branch of ivy, sacred plant of Bacchus, god of wine.